Former MP Denis MacShane is to be charged with false accounting over parliamentary expenses claims, the Crown Prosecution Service has said. Malcolm McHaffie, deputy head of the CPS special crime division said: "Having thoroughly reviewed the evidence gathered by the police, I have decided there is sufficient evidence and it is in the public interest to bring a criminal charge. "This charge relates to fraudulent claims with a total value of £12,900." Mr McHaffie added: "The charge is of false accounting, contrary to the Theft Act 1968. It is alleged that Denis MacShane claimed expenses for research and translation services carried out by a company that did not carry out that work. 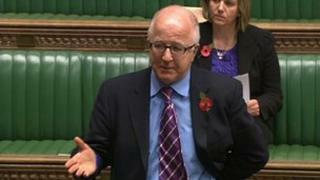 "Denis MacShane now stands charged with a criminal offence and has the right to a fair trial. It is extremely important that nothing should be reported which could prejudice his trial." Mr MacShane resigned as an MP last November after a parliamentary committee said he had wrongfully claimed at least £7,500 in expenses. Although he had repaid the money, and he insisted that he had made no personal gain from the expenses claims, he said he was resigning to show that MPs should take responsibility for their mistakes. Mr MacShane, who worked for the BBC from 1969 to 1977, had been in the House of Commons, as Labour MP for Rotherham, since 1994. He was then Prime Minister Tony Blair's minister for Europe from 2002 to 2005. Mr MacShane will appear at City of Westminster Magistrates Court on 30 July. In a statement on Thursday Mr MacShane said: "I am disappointed at the CPS decision but as the matter is now in the hands of the court I will be making no further statement."